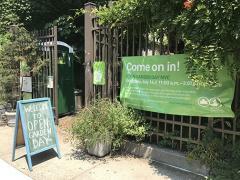 GreenThumb will be hosting Open Garden Day NYC on July 20, 2019 from 11:00 a.m.-3:00 p.m.. Community Gardens across the city will open their gates to the public, rain or shine. If you would like to participate, please fill out this form at the link below by June 7th. We are asking all gardens who are taking part in Open Garden Day NYC to schedule a free activity or event for the public to enjoy, along with some of our city’s finest community garden spaces. Activities can include: arts and crafts, music performances, composting, planting, a food demonstration, or feel free to suggest your own activity. At least one gardener member should be on site the day of the event from 11:00 a.m. - 3:00 p.m..